The locations where you can pick up some Sake in Sekiro: Shadows Die Twice. In Sekiro: Shadows Die Twice, players have the ability to collect a variety of weapons and items including Sake. If you’re looking to improve the conversations you have with certain NPCs and open new dialogue options, Sake can be used. 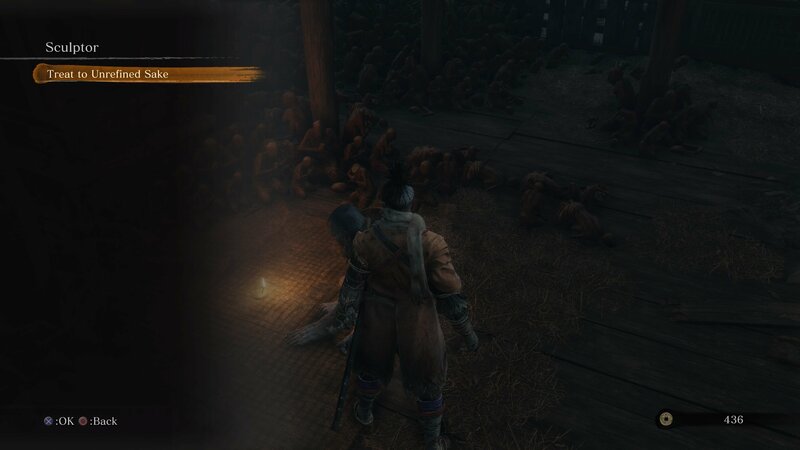 This can be extremely helpful for mission completion, finding things, or simply learning more about the world of Sekiro: Shadows Die Twice. Wondering where to get your hands on some Sake? We’ve got you covered! Below, we’ve put together a quick guide outlining where to get Sake in Sekiro: Shadows Die Twice. There are different Sake types in Sekiro: Shadows Die Twice, each obtained in a different way. By giving Sake to an NPC, you'll unlock new dialogue options. In Sekiro: Shadows Die Twice, Sake can be used to expand dialogue options for certain NPCs, though in order to do this you’ll first need to know where to get Sake. There are actually four different Sake types in Sekiro: Shadows Die Twice with each of them compatible with different NPCs. For example, the Dragonspring Sake can only be given to the Sculptor. If you have Sake on hand but aren’t sure who to give it to, we’ve listed the different Sake types and their compatible NPCs down below! *NB - while you can offer Ashina Sake to Emma, she will refuse it, saying it is a gift for the Sculptor. With Sake on hand, you can visit the NPCs listed above and speak with them. While doing this, you’ll have the option to offer them Sake, although keep in mind that some of these Sake types cannot be earned until much later in the game. Both Monkey Booze Sake and Unrefined Sake are relatively easy to get, while the rare Dragonspring Sake will set you back 1,000 Sen.
To help make it easier to know where to get Sake in Sekiro: Shadows Die Twice, we’ve included locations where we were able to obtain Sake listed below. For more on ways to get Sake, be sure to check out the helpful guide offered by Twinfinite! Unrefined Sake: This Sake can be earned by killing Tokujiro the Glutton, Juzo the Drunkard, and from Isshin Ashina after you beat Genichiro Ashina. Monkey Booze Sake: This Sake can be earned by defeating various monkey enemies including those found in Sunken Valley Passage. You can also earn Monkey Booze Sake by investigating a skull near one of the monkeys in Ashina Depths, and resting in the hands of a statue in Senpou Temple. Ashina Sake: This Sake is given by Emma after you use a Dragon's Blood Droplet to cure the dragonrot for the first time. She will ask you to give it to the Sculptor. Dragonspring Sake: This Sake is the hardest to obtain in that you’ll not only need to purchase it for 1,000 Sen, you’ll also need to reach the Merchant located at Mibu Village. Once you unlock that location, you can interact with the merchant and purchase some Dragonspring Sake, which can then be given to the Sculptor. While Sake can be somewhat challenging to acquire, there are different Sake types and different ways to get a hold of them. Additionally, using Sake to unlock additional dialogue options in Sekiro: Shadows Die Twice isn’t exactly critical to your progress, though it can be a worthwhile endeavor for completionists. Now that you know where to get Sake in Sekiro: Shadows Die Twice, be sure to check out some of our other guides including where to find the Mist Raven prosthetic in Sekiro: Shadows Die Twice, how to beat Headless in Sekiro: Shadows Die Twice, and where to get the Mortal Blade in Sekiro: Shadows Die Twice.